Surrounded by four of the world's ten highest mountains, the Tibet plateau deserves its title "the Roof of the world". It is a beautiful vast land which is home to less than 3 million people. The awesome mountain scenery, magnificent monasteries and ancient culture combine to make a spectacular and unique travel encounter. For many years Tibet with its own Buddhist culture and religion was isolated from the rest of the world but today we are lucky enough to be able to visit and sample just a little of this magical Himalayan Kingdom. Chengdu the capital of Sichuan Province is one of the main gateways to the fascinating Tibetan capital of Lhasa. With a history of about 1400 years Lhasa is a city with bustling markets, sacred temples, and ornate palaces. 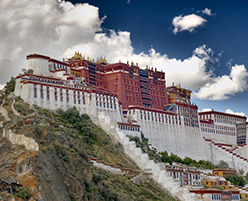 Spend time visiting the Potala Palace, the magnificent residence of the Dalai Lama which is widely regarded to be one of the architectural wonders of the world; explore the sacred Jokhang Monastery, built in the 13th century it is considered the spiritual center of Tibet; and enjoy a walk through the surrounding lively Barkhor market, where traders and pilgrims meet each day to share their fascinating stories. As you leave Lhasa and travel through the dramatic Tibetan landscape you will discover sacred mountains and lakes which draw devoted pilgrims from all over the country. Travel to Shigatse, the capital of the Tsang province famed for the Tashilunpo Monastery with its Grand Hall and opulent Tomb of the Lama. When the time comes to bid farewell to this most mysterious and wonderful land you are certain to have been touched by its warm and spiritual people. The best time to travel Tibet is between April and October, and peak season is from May to September. The best months are May, June, September or October as July and August can be rainy months. The most convenient way to travel to Tibet is by air. From Beijing approx 5hrs, from Chengdu only 2hrs, or from Katmandu just over 1hr. 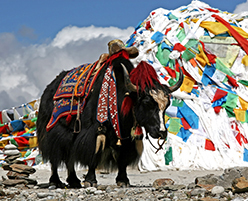 All individuals entering Tibet must hold a passport valid for at least six months. If you are entering Tibet from China, your Chinese visa must be valid. Only travellers with tourist visas (not business, resident or student visas) are permitted. An altitude over 3,000 meters (9,843 feet) is usually defined as high altitude. Altitude Sickness is the biggest health risk to tourists in Tibet. Symptoms include headache, nausea, dizziness, fatigue, shortness of breath, loss of appetite and disturbed sleep. Most people will experience one or more symptoms upon their arrival in Tibet. The symptoms will usually gradually decrease in severity during acclimatization and will usually not interfere with mild activity and sightseeing. It is advisable to check with you GP prior to your visit.